1854: 4 d. blue, the famous INVERTED SWAN variety, technically an ‘Inverted Frame’, a superlative used example with four large margins all round, extremely lightly cancelled for this rarity, with the only fault being an unapparent 3mm. 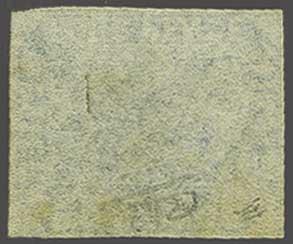 paper break near the centre of the stamp best viewed under ultra-violet light and perhaps a vertical bend, otherwise this stamp can be listed as one of, or perhaps, the finest known example as far as appearance is concerned. 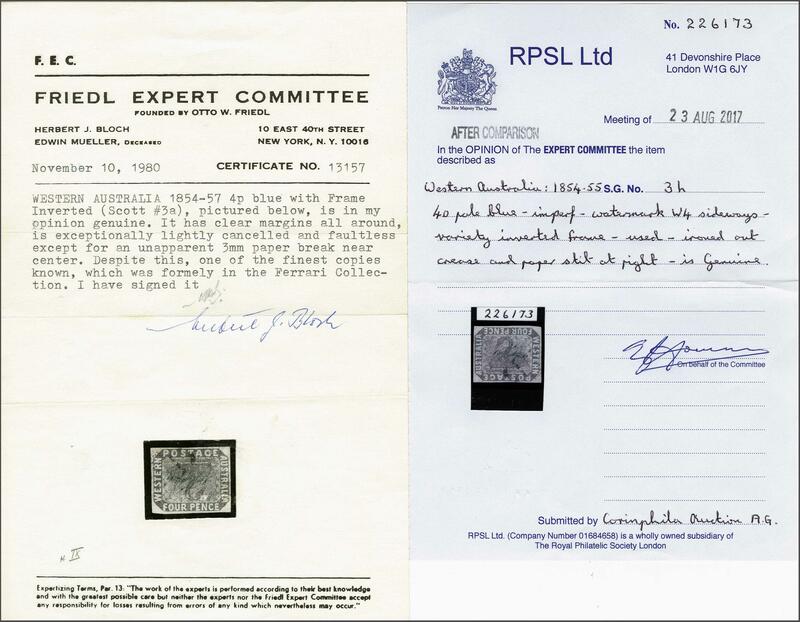 Full listing of how this variety occurred and other relevant information of this error is included with the lot and more infomation is to be found in L. N. and M. Williams "Stamps of Fame" on page 192, where listed as example 'IX'. Just 15 examples of this error are recorded of which 6 are in Museum collections, including one (ex Duveen) in the collection of Her Majesty Queen Elizabeth II. 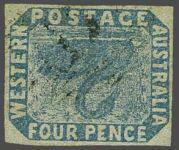 A truly wonderful example of this legendary error, of exceptional provenance and the finest specimen of the most iconic Australian stamp in private hands. Signed Calves; certs. Friedl (1980) RPSL (2017) Scott 3a = $ 95'000/Michel Gi = £ 140'000.rnrnL.N. Williams in Encyclopaedia of Rare and Famous Stamps (1997) listed 14 recorded genuine examples of this variety, of which seven are housed in museums and institutional collections (Royal Collection of Her Majesty Queen Elizabeth II, British Library, London; Australian Museum, Sydney (2; Mitchell Library, Sydney; Western Australia Museum, Perth; National Museum of Ireland, Dublin). From the remaining seven examples in private hands, no less than four are in one private collection.rnrnProvenance:rnPhilipp la Renotière von Ferrary (1923); bought by Tommy Allen for E.H.Collins.rnE. H. Collins collection, Plumridge auction, London (1928); again bought by Tommy Allen.rnSold by Tommy Allen to Theodore Champion (approx. 1929/1930).rnSiold by Theodore Champion at an unknown date.rnRobineau auction (Oct. 1980); bought by Paul Morgoulis acting as agent for an unknown collector.rnDavid Feldman auction (Sept. 1981).